17: the journey is the destination. 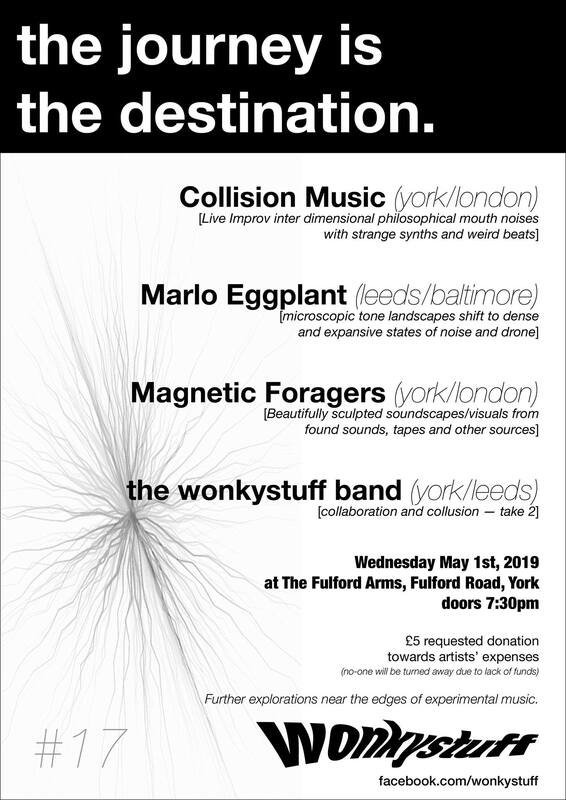 Very excited about this one, return of some local characters (Collision Music) as well as a stalwart of the Leeds experimental scene (Marlo Eggplant). 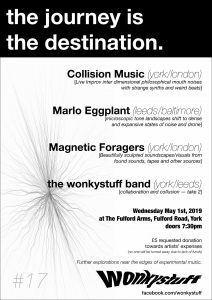 Textural audio-visual presentation from Magnetic Foragers, and the return of the off-kilter electro pop of the wonkystuff house band… it’s all looking pretty damn awesome to be honest. Collision Music: (Va Va Records) Featuring Part2 of New Flesh (ex Ninja Recs with Al Grrr Rhythm & Bruise). Live improv inter-dimensional philosophical mouth noises with strange synths and weird beats. Full on art experience expected! Marlo Eggplant: Born in Baltimore, MD, USA, Marlo De Lara is a sound performance artist currently pursuing a PhD in Cultural Studies at the University of Leeds. Under the Marlo Eggplant alias, De Lara produces textural compositions which develop from microscopic tone landscapes into dense and expansive states of noise and drone. Her works aim to blur the definitions of (un)intentional sound and music. The many noises and tones of De Lara’s live performances are sourced from autoharps, contact mics, vocals and loops, amongst other tools. Her pieces have minimalist origin stories that can be breached through a knowing and often slow-burning approach to improvisation. As curator and organizer of the Ladyz in Noyz (LIN) international compilation series and collective, an ongoing project from 2008 to the present, she continues to promote emerging artists and musicians who are women. 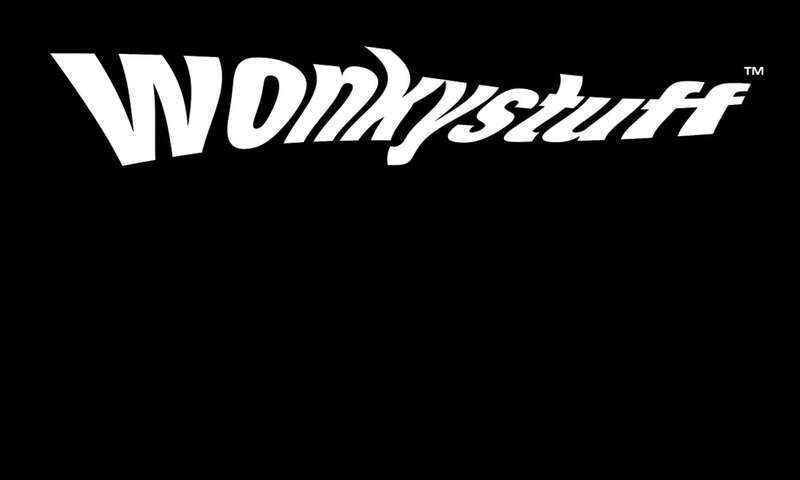 wonkystuff house band: further loose electro-pop collaboration from the staff.